Do you like to backup the main movie of a DVD disc to your hard drive for saving time and space when camping with a Smart TV(12 volt)? Pavtube Blu-ray/DVD Backup tool can help you to do this with just several mouse clicks. This article shall introduce a short illustration on how to backup DVD main movie inVOB to Hard Disc so that you can watch them on smart TV(12V) without quality loss on Windows 8.1/8/7. You may not like to carry personal laptop, tablet or DVD player to watch a DVD movie when camping; but most camps have smart TV with 12 volt system from car, boat, caravan, etc. Hereby, you can backup DVD collections to hard disc for playback on LED smart TV(12V). What’re the best settings to backup DVD main movies to hard disc? How can we remove DVD protection? Follow this article and you will know how to proceed. To prevent from unfair or illegal use of DVD content,every commercial DVD is armed with one or more Copy protections. However, according to Court Backs Dismissal of Digital Copyright Claim, it is not illegal to backup your own DVDs. Here are some of commonly used DVD encryption technologies, which hold you back from backup DVD smoothly.E.g.Content Scramble System (CSS), it creates scrambled DVD content to protect the DVDs information from piracy and the Region Protectionenforce region-based viewing restrictions. And as for Sony ARccOS Protection, it is designed as an additional layer to be used in conjunction with CSS. This system deliberately creates corrupted sectors on the DVD disc, which cause majority of regular DVD copying software to produce errors. You may also hear of Disney DVD Copy Protection equipped at the latest released DVDs. It disordered the DVD content to make users hardly locate the right title which contains the main part of the movie. Even though you trudged out to copy full DVD content, you will get about 50GB output file size and the out-of-order videos that are totally useless. Find Proper DVD Backup Software and start backing up your DVDs in vob format and copy to hard disk regardless of any DVD restrictions. One authoritative software reviewing website – CNET, has assessed that it will takes 30 – 50 minutes to backup a general D9 DVD disc (read the full review). But with Pavtube BDMagic, you can make perfect 1:1 DVD to VOB copy with 5 – 10 minutes only, at the meantime, you are ensured to achieve 100% original DVD image quality, which is nearly 3 times better than conventional VHS, and 5.1 Dolby Digital surrounding sound. Install and Run this BDMagic; Insert your DVD (you will need to get an external Blu-ray drive if you want to backup Blu-rays) till it show as a disc icon on desktop. Click “Load files” to import DVD, DVD IFO/ISO or DVD folder; and the same as the Blu-rays. Step 2. 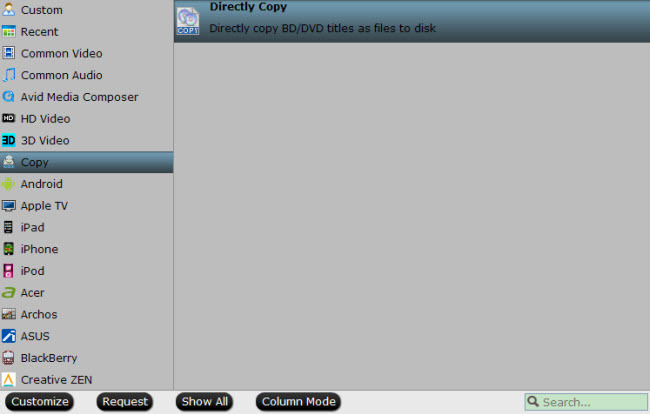 Click “Format” drop-down list, choose “Copy -> Directly Copy” to output lossless backup VOB file of your original DVD. Step 3. Start lossless backup DVD in .vob format. Now back to main interface, click “Convert” to start backup DVD to hard disc for playback on smart TV. After the conversion, you can click “Open output folder” to quick locate the converted video. Now used a USB port adapter to connect your hard drive and transfer DVD movie to smart TV with 12 volt system. How to connect hard disc to smart TV? Despicable Me 2: fancy the 2010’s “Despicable Me” and the funny Minions? The “Despicable Me 2” is much more hilarious and there’re tons of Minions or more. In this sequel, the three girls are as sweet as the first film; and Gru is a little bit different from what he was in the first part: smiles more and all his attitude softened. But everything is different when Gru recruited by the Anti-Villain League to help deal with a powerful new super criminal. Will he fulfill his task smoothly? Monster University: A look at the relationship between Mike and Sulley during their days at Monsters University — when they weren’t necessarily the best of friends. Pacific Rim: As a war between humankind and monstrous sea creatures wages on, a former pilot and a trainee are paired up to drive a seemingly obsolete special weapon in a desperate effort to save the world from the apocalypse. Planes(Disney): A crop dusting plane with a fear of heights lives his dream of competing in a famous around-the-world aerial race. Do you also have DVDs above? In order to watch these Hot DVD movies on PC or portable devices such as iPad Air, iPad Mini 2, iPhone 5S/5C, Kindle Fire HDX, Google Nexus 5, Nexus 7, iPod 5 and more without advertisement in the beginning, all you need to do is to copy DVD main title according to the above steps. You can back up DVD main title to a single VOB file without the necessity of copying all content of DVD movie. The most important merits can be summarized into two major points: time-saving and space-conserving. Time-saving: save your time in both movie watching and DVD conversion. By copying the main movie title, you can get rid of watching advertisement that probably wastes several minutes in each movie. Moreover, full DVD copy costs nearly 20 minutes in average. WinX DVD Copy Pro, taken as an example, spends 5-10 minutes in producing a 1:1 DVD copy (depending on the CPU of computer and size of DVD). However, you need only 5-7 minutes to copy main DVD title with the same software, which saves about 10 minutes for you to copy a single DVD disc. Space-conserving: save the room of your computer or portable device for storing the converted DVD video file. Generally, the capacities of DVD5 and DVD9 are 4.7 and 8.5G, respectively. That is to say, a complete D5 requires about 4.7G free space to either in case of backing up DVD to ISO image file, copying DVD to a single MPEG2 file or cloning DVD to VIDEO_TS folder. In comparison, copying DVD main title needs 4-4.5G free space. This space-occupying difference between full DVD copy and main title copy may be slight. But just imagine, what about copying 10 DVDs? Yes! It can reduce 7G space for you! This number can even be multiplied immensely. According to statistics, 100+ complete D9 DVD movies can be stored in a 1TB hard disk. So, if backing up 100 DVDs on hard drive, you will cut down 70G storage space maximally. 1. Filter the unwanted parts of DVD: by copying main DVD title only, you can remove the unnecessary portions, including advertisement mentioned above, opening theme song, ending song, NG and tidbits, etc. 2. 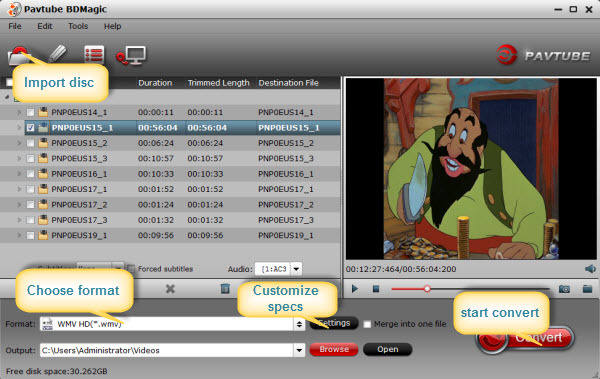 Make your video compact: you can copy your DVD without extras by only choosing main title copy. Thereby, you can have a DVD collection with more movies, and can head straight to the movie content without watching the endless ads, listening to the theme songs you are not into or awaiting the endless Cast of Characters. It is more convenient for the further edition of video. Still have trouble about copying DVD main title to Hard Disc for watching? Hope the guide can help you. Or you can feel free to Email Us. Can’t Rip DVD with MPEG Streamclip on Windows/Mac? Fixed!